CADE Estate Winery sits high above the fog line on the dramatic slopes of Howell Mountain, just northeast of the town of St. Helena. The building's striking architecture, a dialogue between gentle contours and strong rectilinear forms, suggests the complexity of their wines – powerful yet nuanced expressions of their mountain terroir. The winery blends right in with the impressive contrasts of the estate, a spot where cultivated vineyard rows meet tall evergreens and native Manzanita trees, all set against a backdrop of staggering Napa Valley vistas for a visitor experience not soon forgotten. 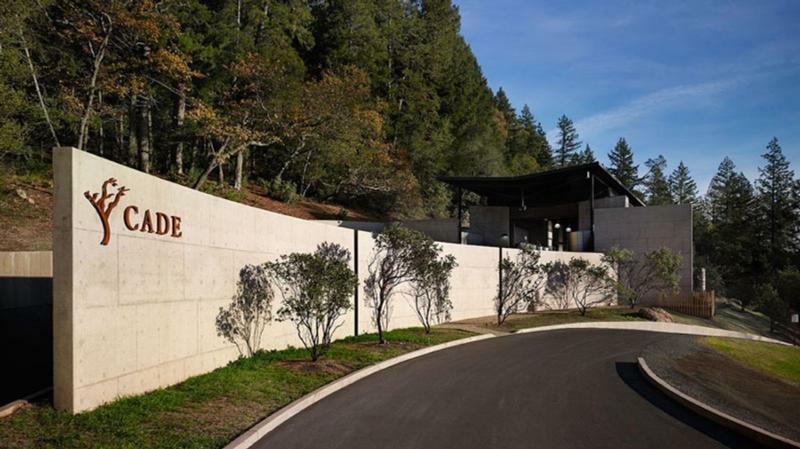 In 2005, Gavin Newsom, Gordon Getty and John Conover established CADE Estate Winery to craft luxury, high-altitude estate Cabernet Sauvignon from Howell Mountain as a complement to the valley floor wines of PlumpJack Winery. Like PlumpJack, CADE takes its name from Shakespeare, who used the term to refer to the wine casks – or cades – shipped from Bordeaux to England during Elizabethan times. At an elevation of 1800 feet, the estate – 54 contiguous acres surrounding the winery – experiences a unique temperature inversion. During the day, conditions are cooler than those on the valley floor; evenings, on the other hand, grow warmer with the setting sun. This gives the grapes extended hangtime, allowing them to ripen fully and evenly for wines of exceptional density and balance. Our mountainside soils, characterized by volcanic ash and minerals, provide beneficial stress to vines that further concentrates the character of this unique terroir. The team at CADE Estate believes that winemaking should honor the land, both aesthetically and ecologically. The estate's artistic, contemporary design, with its inviting rooms and wide open terrace, encourages guests to discover the ever-changing interplay among natural and architectural spaces. The environmentally responsible construction includes solar panels, naturally regulated caves, reclaimed and recycled materials and much more. CADE is proud to be the first organically farmed LEED (Leadership in Energy and Environmental Design) Gold Certified estate winery in Napa Valley.